I think the speaker is Renko, but I’m not too sure – since the other songs in the album are narrated from both Renko and Merry’s points of view, it’s also possible that the same thing happens here. Either way, the lyrics don’t really give much away about who’s speaking and who’s doing what to whom (which is what I always complain about >_<). The random English kind of interrupts the flow of the lyrics, and I feel like the lines are a bit too long sometimes, but I tried to accommodate for them as best as I could. Aah, our souls are in that unusual environment. We snuggle up together. I’m not making a dark face! I smile faintly, (and you) poke at my cheek. Whilst I’ve grabbed hold of you, (I won’t let go,) I carry you to a far off place with these hands – a long way. A landscape we’d never seen before lies beyond the horizon we crossed over. You kick at a puddle of water, and my face gets wet. Don’t bend away at my heart – I want to believe in you! Aah, I wanted to say something to your glum face, but I believed in the superstition known as infinity. My feelings will surely leak out from my ‘self’ soon… I’m absurd – I run off. We laugh, because those (roads) we’ve never travelled along are still new. You made me aware (of all the) small things. My dear friend, you are tied to my immature self. I’ll leave you behind, beyond the horizon that we run upon! My smiling face is reflected after the rain. My friend! Hey, you won’t get angry, right? I’m not doing it on purpose. Thus, we walk away now, as well. We fly away. (Aah, the two of us continue onwards on our endless journey. We run, with our hands linked together. 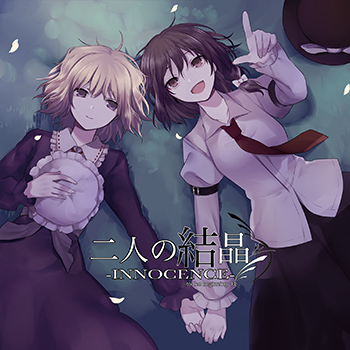 Album cover kinda tells me it’s Renko talking here. Although this probably wasn’t the only arrangement related to the two. Anyays, thanks you. I expected the lyrics to be a bit different and must say, I don’t really like these as much as I thought I might. I appreciate your work nonetheless! I think it’s both, Merry and Renko speaking! (At least that’s how it is in the other songs that are about them on this album) I think it starts out with Merry and then Renko’s talking… But I’m not sure either!